Should run on El Capitan and higher. No sound support, as that is still experimental. Build from source for Qemu 3.0. Not much news regarding PPC emulation, but some speed up in disk performance might be noticed. Perhaps someone didn't like the sound of Qemu 2.13, so we were bumped to version 3.0.0. Build from Qemu 2.12 final code. Compatible with El Capitan and upwards. Please note the inclusion of the pc-bios folder, which requires the -L pc-bios parameter in the command line for Qemu to find some required files such as openbios-ppc and qemu_vga.ndrv. Our guide has been updated accordingly. Also included are two scripts that can be used to run Qemu with tap networking. Compatible with El Capitan and upwards. Should be compatible from Mountain Lion upwards. -This also means OSX 10.0 and 10.1 are now supported out of the box. I fixed the references from qemu-system-ppc and qemu-img to libs on which it depends (those I installed through brew to enable compilation) with the OSX install_name_tool which is part of Xcode. As one of the required libs itself also has dependencies, I fixed those too. You can find the entries to dependent libs by using the OSX otool this way: otool -L "executable name" or "Library name". #qemu-system-ppc, qemu-img and the library libgthread-2.0.0.dylib have dependencies on libraries normally not installed on a user machine. This batch file changes the dependencies of qemu-system-ppc, qemu-img, and libgthread-2.0.0.dylib to point to the libs contained in a folder Libs located besides the executables. #Find the required libs and place them in a folder called Libs besides qemu-system-ppc and qemu-img. #Place this batch file besides qemu-system-ppc and qemu-img and run it. Last edited by Cat_7 on Sat Jul 01, 2017 12:49 pm, edited 8 times in total. 08-02-2019: Qemu 4.0pre with altivec acceleration. Note: this build was compiled on El-Capitan with clang7. 08-02-2019: Qemu 4.0pre with altivec acceleration and screamer audio support. Read the readme in the vga-driver folder. Sound support for 9.0 to 10.5: Screamer-enabled build based on recent source. Make sure you always have the latest QuickTime and iTunes version installed in your guest OS. Qemu 3.0 RC1 build for running Morphos on OSX. Last edited by Cat_7 on Thu Jul 06, 2017 5:23 am, edited 5 times in total. Thank you very much cat_7, it's looking great so far. Just a couple things: in Windows instructions - startqemu.bat, one of the parameters is to load openbios-ppc-pcifix as the BIOS, but the one linked to download is just openbios-ppc. I changed the command to open the bundled openbios-ppc (new version from your second forum post), which resolved a QEMU crash and brought up OpenBIOS then the boot screen. You might want to edit the command line to prevent it happening to everyone. Secondly, by running this (on OS X 10.4) I get the boot screen, with the logo and spinning wheel, but it stops spinning after about 10mins. I tried to enable verbose mode but I'm not getting it to do so (-prom-env 'boot-args=-v' seems consistent with OS X instructions, but not Windows). How do I enable verbose mode from here? I believe that perhaps the problem could be that there IS a ppc-pcifix version which you may have needed to bundle instead of the ppc version. I updated the guide to reflect the need to rename the file or edit the windows batchfile to point to the correct file name. So it seems. Replacing all quotes with " instead of ' will allow providing arguments. Fixed in the guide. No there isn't. The latest bios file cumulatively adds all previous fixes. Overall, the windows version is much slower compared to the OSX version and has the nasty habit of losing mouse control. I'll check the 10.4 installation issue. Please note that the windows versions are created whenever there is a new official qemu release. The OSX versions are created when promising new developments are available. This leads to OSX versions probably having more/better functionality when compared to the windows versions. EDIT: quotes fixed when providing arguments in Windows version. Windows version boots 10.4 CD image perfectly! Alright, thanks. It looks like most of these things can be avoided by using OS X instead, so I'll proceed to do so. Edit: OS X 10.4 didn't like QEMU on OS X, so it may have been a faulty image I was using in the first place. 10.3 installed fine using QEMU on OS X, but not on Windows - lost mouse cursor through installation menus. Workaround: installed on QEMU for OS X, then moved image to QEMU for Windows. Works a charm. Making a couple optimisations - screen size is flexible, as is RAM, no problems increasing those. I'm now looking into possibly enabling audio, or even video(!) but I'll need to look into whether PowerPC kexts even exist for any available emulated devices QEMU provides. Super happy with the outcome so far. Thanks again Cat_7. Set up this QEMU distribution in OSX 10.10.5 for installing Mac OS X 10.3. I used Disk Utility in OSX to create disk images from the three Mac OS X 10.3 install disks in DVD/CD Master (.cdr) format. I used qemu-img to create a 6G raw disk image for the installation target volume. First installer image is named "10.3InstallDisc1.cdr"
Target volume image is named "Qemu10.3HD.dsk"
Something wrong with the CD image? Please take great care not to have additional line endings in your command file. Did you create the image from your own disks? The whole command is in one line, no additional line endings. I created the images from my own install disks. They are regular retail install disks. For creating the CD image in OSX Disk Utility: The first time I selected the CD volume in the left column in Disk Utility (as I normally do) but this time I selected the CD drive. I will report back when I did the 10.3 installation in QEMU. Did a default 10.3 installation from install disks 1 and 2. The 6GB image I created with qemu-img wouldn't work. I could partition it with Disk Utility on the install disk, but the installer labeled it with a red exclamation mark as not suitable for installation. No change after re-partitioning. After completing the installation by configuring the new installed system and an account, I looked at my 10.3 Desktop and everything seemed OK. I shut down the emulated machine and went shopping. Started again QEMU but now startup is stuck at the grey screen with Apple logo. Installed 10.3 again. This time I left out all software that I will not use. Again everything looks OK after installation and setup. But after shutting down the emulated machine, again a new startup gets stuck at the grey screen with Apple logo. Sorry, startup does not get stuck. It stays longer at the grey screen than I expected. Last edited by Ronald P. Regensburg on Mon Jan 11, 2016 3:28 pm, edited 2 times in total. Internet connection works, but apparently Apply does not provide software updates for 10.3 anymore. You can download the Combo update from https://support.apple.com/kb/DL496?locale=en_US manually. I'm not sure whether that includes the 'latest' security update though. Disk image creation updated in the guide. Installing the combo-update proceeded fine. Now running 10.3.9. The emulator is slow, but usable. With file sharing enabled on the host, I can access files and folders on the host from within the emulator. Will probably work also with other computers in my home network, didn't try yet. With 10.3 drivers for my Canon printer installed, I could probably print to that printer on my network. Didn't try that yet either. 2. I accidentally chose sleep (instead of shut down) from the Apple menu and the emulator froze. No mouse cursor, no reaction on any key press. 3. For mounting CD images ("change ide1-cd0" from the Machine menu), the Open dialog only allows choosing .iso files. It should also allow choosing .cdr files. I followed the guide, installed 10.4 and updated to 10.4.11. Had a lot of trouble with various cdr and iso images from the net until I ripped my own retail Tiger DVD and installed from there. I lost network after update to 10.4.11. What bothers me the most is the long wait at boot. Apple is displayed for 1-2 minutes and then boot proceeds (verbose). Also the "a" key is "pressed" when switching from host (10.10.5) and QEMU. To sum up, for me it's usable and working but slow. Thank you for the feedback. Emulation is indeed slow, and loosing network support after updating to 10.4.11 is a known issue. I just fixed this problem today. Now you should be able to open .cdr files. These are really amazing proceedings! Thanks Cat_7 for providing the self contained package, saving me from the dependency hell. Thanks Ronald for posting your experience with the HD image. Last not least thanks to all developers and contributors making this happen, I would not have believed this until seeing it with my own eyes. I´m installing 10.3 from ISO images on a 10.10.5 C2D host right now. Installing from ISO 1 works fine so far, but after changing boot volume to "c" it looks like nothing is happening - yellow screen for some time, than black screen endlessly. After removing the CD image from qemu.command it boots! Obviously I have missed that in the guide. Now, could someone please enlighten me how to set up a shared folder? /Classic would be my shared folder on the host, in case that matters. Thanks Cat_7 for your precompiled qemu for OSX. I always been able to install Mac OS 10.3 from the Mac OSX 10.3 Install Disc1 but not with the last compile qemu_2.7-rc0-OSX from 23juli. I got so far that I can select language but then the mouse and keyboard disappears and the only thing to do is close qemu from the outside. With the emu_2.7-pre-OSX precompile from 15juli everything works OK. Maybe everything will be good in RC1. (I work on an Macbook 2010 with OSX10.11.5). I noticed in the new topic http://www.emaculation.com/forum/viewtopic.php?f=34&t=9005 that I have to spec -cpu G3 in the command line with the latest QEMU because it default to G4. So now I'm happy with no problems with MacOSX 10.3 installation. I'm trying to get Mac OS 9.1 running using the guide. I'm using the Qemu 2.7-rc0 package linked in the guide and a german Mac OS 9.1 image. Do I need a different image file? 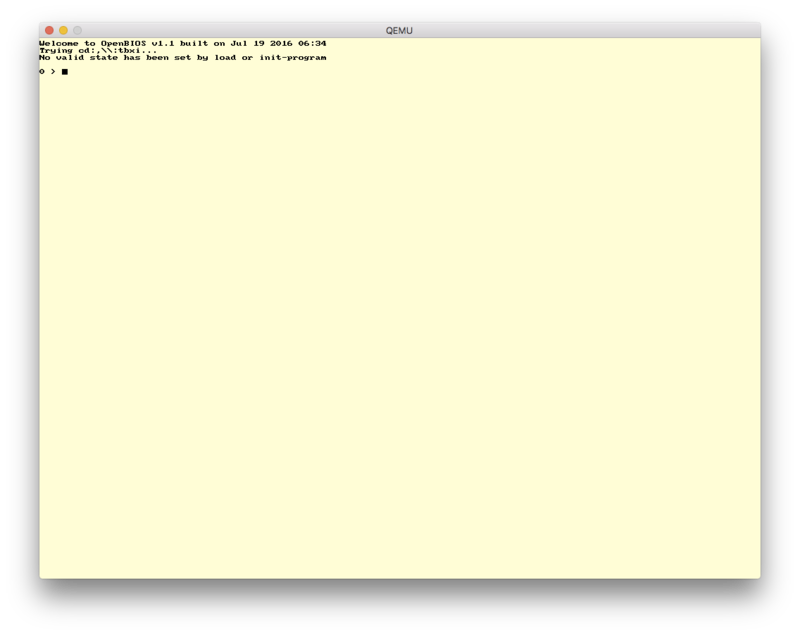 You command line seems OK. Please note that you need to put the disk or cdrom entry you want to boot from as first entry in the parameter list and also adjust the boot "c" or "d" setting accordingly. I would assume your images are not OK. Why don't you try first with some sure to work images?